Britain's weakened prime minister Theresa May says she does not expect to secure a quick breakthrough in Brexit talks that would give her fractured party the reassurances needed to get her deal through parliament. Arriving in Brussels on Thursday just a day after a failed attempt to topple her at home, May was met largely by readiness to help from European Union leaders but also by a warning: we will not reopen the divorce agreement struck last month. Britain's departure from the EU, its biggest shift in trade and foreign policy for more than 40 years, is proving anything but smooth, complicated by the deep divisions in her Conservative Party, the lower House of Commons and the country. With less than four months before Britain is due to leave on March 29, May faces deadlock in parliament over the deal, which has hardened opposing positions at home, throwing up more uncertainty for businesses trying to predict what will happen to the $US2.8 trillion ($NZ4.08 trillion) economy. "I recognise the strength of concern in the House of Commons and that is what I will be putting to colleagues today," May said. "I don't expect an immediate breakthrough, but what I do hope is that we can start work as quickly as possible on the assurances that are necessary." EU leaders were clear. They all said they needed to know exactly what May wanted to secure in Brussels but also warned that Britain could not renegotiate the withdrawal agreement. While others tried to temper their language by expressing a desire to help May, French President Emmanuel Macron was blunt. "We can have a political discussion tonight, but the legal framework and the agreement that were negotiated are not supposed to change," he told reporters. German Chancellor Angela Merkel was less strident, saying: "We can of course talk about whether there are additional assurances but in this the 27 EU members are together and will make their interests clear, although always in the spirit that we want very, very good relations with Great Britain after Great Britain has left the European Union." May will meet the EU leaders to discuss Brexit later on Thursday, less than 24 hours after she survived a no confidence vote among Conservative lawmakers in London, when critics of her plan tried to bring her down. She won the secret ballot 200-117 but the size of the vote against her deepened divisions just weeks before parliament needs to approve a deal to prevent a disorderly exit from the EU. Victory also came at a price - May promised she would step down by the next election scheduled for 2022. "I said that in my heart I would love to able to lead the Conservative Party into the next general election but I think it is right that the party feels it would prefer to go into that election with a new leader," she told media. Her spokeswoman said in London that the Brexit deal would only be put before parliament "as soon as possible" in January. Before then, May hopes to secure political and legal assurances from the EU over the so-called Northern Ireland backstop - designed to prevent extensive controls on the border with the Irish republic that could disrupt a peace settlement for the British-ruled province. But while EU leaders said they wanted to help, a draft EU statement said they were merely "ready to examine" whether further assurance can be given. Austrian Chancellor Sebastian Kurz said it was hard to know what the EU should give to May because it was not clear what she needs to win over opponents. "Not all the arguments of Brexit supporters are rational," he said. Lithuanian President Dalia Grybauskaite put it more bluntly. "Brexit Christmas wish: finally decide what you really want and Santa will deliver," she said on Twitter in posting a picture of a chocolate Christmas tree. The backstop is the main stumbling block for lawmakers in London who fear Britain will become stuck in the fallback arrangement, complicating efforts to strike trade deals beyond the EU. The level of opposition to her deal was underlined earlier this week when May was forced to delay a parliamentary vote on her deal, designed to maintain close future ties with the EU, for fear of a defeat. 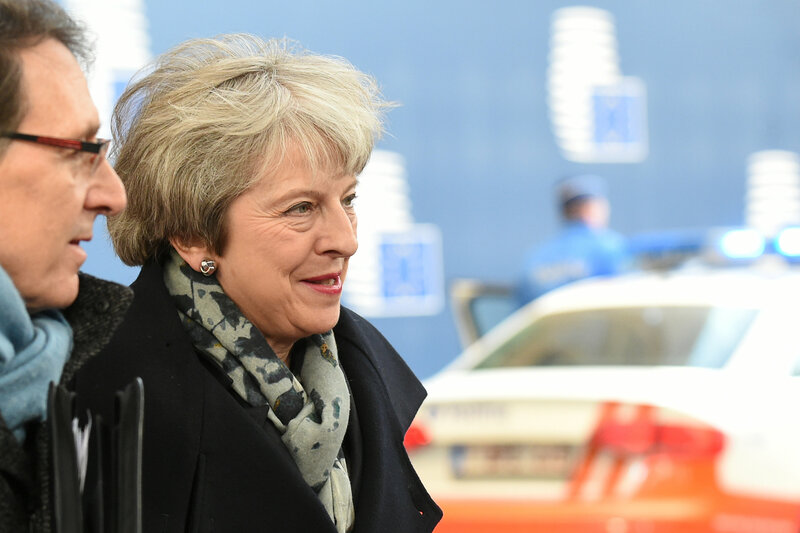 May, who met Irish Prime Minister Leo Varadkar in Brussels and EU summit chairman Donald Tusk, wants legal assurances that the backstop will not remain in place indefinitely. The EU's draft statement, seen by Reuters, reiterated that it prefers a new trade deal to triggering the Irish backstop and it would try to conclude one swiftly, even if the emergency border fix kicks in. EU states were not in agreement on the text on Thursday morning, however. Diplomats in Brussels expect it to change after May tells the other national leaders what she needs to push their deal through her parliament. They suggested the EU may be readying more solid assurances for May in January. "Today is about de-mystifying this whole Northern Ireland backstop. Nobody in the EU wants to use it. But we need to have it," said Dutch Prime Minister Mark Rutte. "How to make that clarification on paper - that's something we have to look at."